As the number of cat cafés has grown so has the beverage selection. 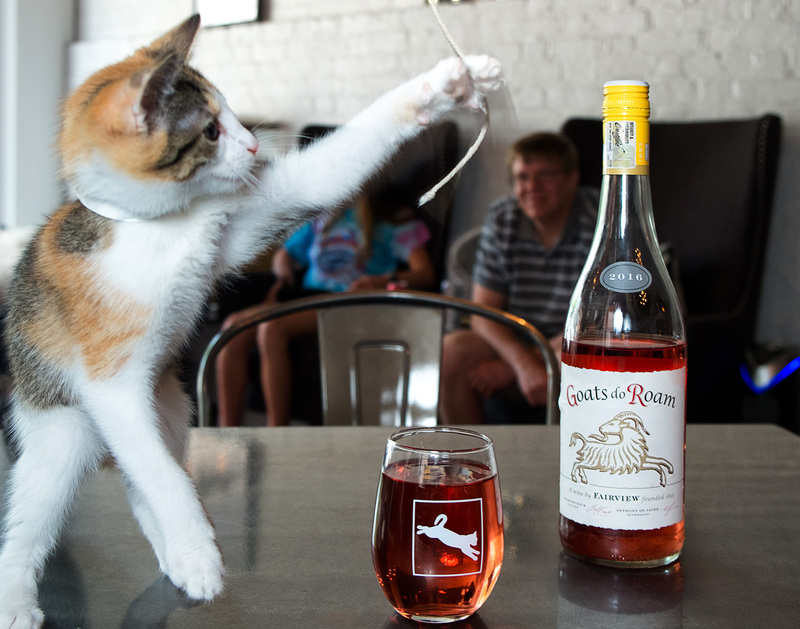 Enjoy wine with a new feline friend—or just look at these pictures of adorable kittens. For pet-deprived people and unabashed feline aficionados, cat cafés have long been places to enjoy a coffee or tea while playing with kitties. The first one opened in Taiwan in 1998, and they became popular in Japan over the last decade. Now, cat cafés have spread throughout the world, and their offerings have expanded, too. In the U.S., many cafés offer cats for adoption, and some add wine and beer to their beverage offerings. Here’s where you can enjoy an alcoholic beverage in the company of furry little friends. Pounce, in Charleston, South Carolina, houses cats from the city’s Animal Society, and it boasts the most adoptions of any cat café in the country. For $15, guests can spend an hour in the company of 20 roaming cats while they sip a glass of “purr-emium” wine, beer, tea or coffee. New York City’s, Koneko Cat Café, is the first cat café to serve alcohol, The name, koneko, is Japanese for “kittens.” Adoptable felines roam freely in the sunlit Upper Cattery, a Lower Cattery and an outdoor patio. Reservations are recommended; a one-hour “cat nap” is $15. The café is a separate room that serves snacks like edamame and gyoza, Stumptown coffee, saké, Japanese beer and a rotating selection of wine. At Colony Café in Pittsburgh, you can find Third Wave Coffee, wine and cat-themed cocktails, many of which include wine. A favorite, the Felix, is made with vodka, Pinot Noir, lime juice, agave nectar and grapefruit soda. At Colony, a one-hour visit goes for $8, which helps support the café’s mission to find homes for the city’s at-risk cats. Located in Portland, Oregon, Purringtons serves locally produced craft beer, cider and wine alongside small bites. In a separate room, for $8 per hour, you can relax with kitties from Cat Adoption Team of Sherwood, Oregon. Those looking to incorporate cats into their exercise routines can go to a weekly Purr Yoga class.